Before kick off we were treated to a short video of Lander Sports work in China and some of the sports stadia that they have been responsible for. After this with a bit of a fanfare we were introduced to Saints new owner Jisheng Gao, who was in the director's box and wearing the obligatory Saints scarf. Returning to the match, this was a great antidote to the appalling Watford game, but the end result was similar, in that Saints did not manage to score - again. That was about the only thing that was the same though. Another brick was put in the team, as Mauricio Pellegrino seems to have found a goalkeeper, back four and midfield that work. Now all he has to do is sort out the flanks and forward. Fraser Forster was in goal again, with a back four of Cédric, Yoshida, Hoedt and Bertrand. In front of them were Lemina and Romeu, with Davis operating just in front of them. Long was again the lone striker and Redmond and Tadić were on the flanks. From the kick off Saints were way too tentative in dealing with ManU's marauding forwards, with Lukaku looking especially dangerous. The balance of play was fairly even, but the United forwards were much faster on the break and did so in numbers. Saints on the other hand were effective going forward, up to a point. That point was in and around the opposition penalty area. Tadić and Redmond were both too slow and too predictable. Eventually, in the 20th minute one of the Manchester United breaks told and although Forster made an astounding reaction save from Lukaku's initial shot, the rebound fell straight to the big Belgian and it was 0-1. It was only about now that Saints started to play, or maybe it was ManU sitting back. Anyway, our two summer signings began to catch the eye. Hoedt in the heart of the defence was dominating everything in the air, although nobody would describe him as quick, his anticipation more than makes up for the lack of pace. Meanwhile, Lemina, who first began to impress at the Palace game, was good in the first half and together with Romeu, had the midfield wrapped up tight in the second. Some have described him as Wanyamaesque, but I think that he is actually better than that. He can pass for more than 5 yards for a start! He is quick and determined in the tackle and once he has won the ball, he is hard dispossess. We haven't seen such a complete midfielder for many a year. The longer that Romeu and Lemina play together, the more matches we will dominate. 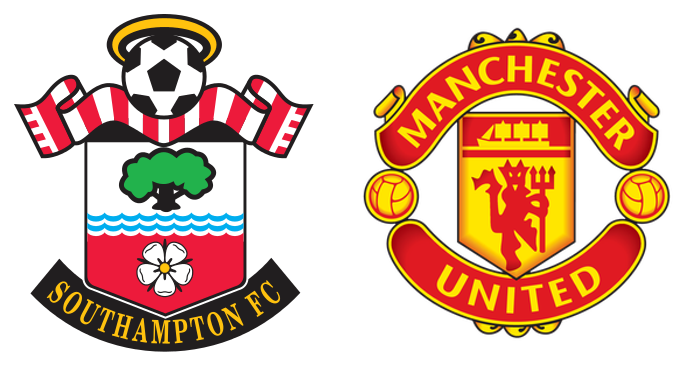 The first half finished with Saints fast improving and ManU seemingly happy with their 1-0 lead. The feeling at half-time, was that it was an entertaining game, but Saints really needed to "get at them" (as the guy in front of me said! ), otherwise the danger was that ManU would sneak another goal on the counter and then it really would be curtains. Saints came out and proceeded to really "get at them", Lemina and Romeu were central to this and they didn't give their opposing midfield a sniff. ManU tried bypassing the pair, but Yoshida and the excellent Hoedt picked up the majority of those attempts. Cédric was equal to the task of keeping Rashford quiet and was able to launch the vast majority of Saints attacks up the right side, although he seemed to get increasingly frustrated with Tadić and was seen several times giving the Serb a piece of his mind. The left flank was less productive with Bertrand finding himself frustrated with a lack of support from Redmond. Increasingly Saints seemed to be having most joy in the centre, with Romeu in particular having a shot cleared off the line by Fellaini, with de Gea beaten all ends up. Saints appeared to have set up camp in the United penalty area and yet they still could not make the breakthrough. Mauricio Pellegrino then replaced Davis with Gabbiadini, but the Argentinian rapidly learned what all Saints fans know, namely that Davis is key to the team functioning. After ten minutes of this he decided to be more proactive and replace Cédric (who couldn't actually believe that it was him that was being subbed) with JWP and Long with Austin. Saints tried everything they could, but the ball simply would not go in. The never dull José Mourinho was getting mighty agitated on the touchline. Eventually in stoppage time the referee, Craig Pawson, called a halt to the game and walked over to speak to both the Fourth Official and Linesman. The end result was Mr Pawson sending off Mourinho for stepping onto the pitch. The Portuguese then very theatrically shook hands with Mauricio Pellegrino and every single one of Saints coaching staff, before disappearing from view. None of this play-acting affected anything, with United holding out under the barrage of crosses and shots from Saints. A very exciting game, albeit an ultimately unsatisfying one (a bit like a Chinese takeaway I suppose), but one that does at least promise much for the future. We just need to sort out the front three now. My Man of the Match was Mario Lamina, who grew in stature before our very eyes. A very worthy addition to a previously powder puff midfield, where Oriol Romeu has previously tried to do everything himself. We now have an iron fist in a velvet glove. We have exciting times ahead.